Piedmont is one of the most famous wine regions in the world and a “must do” for true wine lovers and collectors. 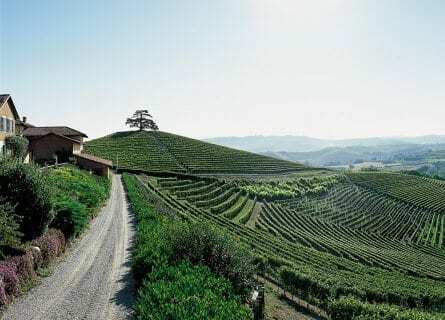 On this luxurious Wine Tour, you can look forward to VIP wine tastings at premium small Barolo and Barbaresco estates (as well as lesser known boutique estates in Gavi, and Tortona); crème de la crème restaurants (Piedmont, or “Piemonte” is a gastronome’s paradise), chocolate and vermouth in elegant Turin and some spectacular scenery in the Langhe- especially if you tour in the autumn when the vineyards are at their most beautiful (autumn is also fabulous as it is the white truffle season and when Alba hosts the exciting international truffle fair and auction). Your private driver guide will pick you up in Milan and you will head south into the Piedmont wine country. Over the next week you have some amazing food and wine experiences to look forward to! Visit cult producers like Walter Massa and Roagna; top Dolcetto experts like Einaudi and Mossio; beautiful estates in La Morra and Barolo and historic cellars in Canelli. 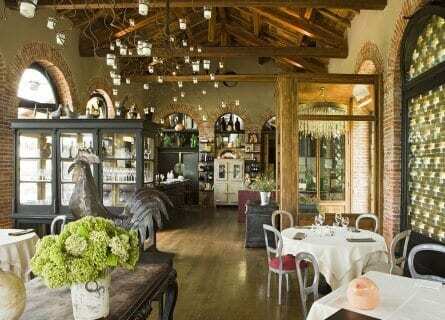 Exquisite restaurants are included on this unforgettable tour such as the mythical Piazza Duomo in Alba, Combal Zero outside Turin (one of Italy’s most interesting modern Michelin starred eateries), the elegant yet warm Gener Neuv in Asti and one of our personal favorites- Belvedere in La Morra. You will love your meals and wine tours! Other highlights include an artisan beer tasting, Savoy Palaces and the Grinzane Cavour fairy tale castle. Sip on velvety Barolo wines, sleep in a luxurious wine spa “Relais” and dine on homemade pasta topped with deliciously freshly shaved truffles. If you are looking for a luxurious wine tasting vacation in Piedmont, than look no further! Lunch is next a few minutes drive in Salice Terme. Ivan Musoni’s revered Michelin starred restaurant is a treat and you will sit down to a chef’s tasting menu of seafood specialties paired with some excellent Piedmont wines. After a leisurely and stress free lunch, your driver will take you further south towards Gavi. You will be sleeping at a wine estate tonight, in a beautifully restored 18th century farmhouse. Enjoy the rest of the afternoon at your leisure to enjoy a walk amid the vines. Dinner tonight will be on your own at the hotel’s exceptional restaurant, La Gallina. How about wine for breakfast? Not exactly, but you will indulge in some wine tasting shortly after, at the onsite Villa Sparina winery. Villa Sparina produce some of the best Gavi wines (that share the namesake with the medieval town). Gavi wines are made with the white Cortese grape and are light and delicate on the palate and smell like spring white flowers. You will taste a range of wines from Gavis to Barberas. Late morning, your driver will take you on to Asti. Asti town and its province was one of the wealthiest in Italy, especially from the 11th to 14th centuries and there is a wealth of architectural reminders from this era. If you happen to be visiting in late September, we can organize for you to see Asti’s spectacular medieval Palio! You will love your gourmet lunch today, at Gener Neuv. Facing the Tanaro River, this outstanding restaurant specializes in traditional Piemontese cuisine, presented with flair and style. Flagship dishes include Gnocchi stuffed with Castelmagno cheese, Lasagne Rustiche alle Verdure, baked quail’s eggs with black truffle and cheese fondue with truffles. After a marvelous lunch, you will enjoy a guided tour of Asti with a wonderful local guide. Known for its bubbly (Asti Spumanti), this little working town is mercifully free of tourist crowds and has some beautiful churches, medieval streets and squares. Carry on to historic Canelli next to visit one of their “wine cathedrals”. Canelli is famous for its vast underground network of wine cellars dating back centuries and still in use today. You will see one of the most beautiful wine cellars like Contratto, enjoying a VIP tour of the caves and a private tasting. And finally in the late afternoon, head to the hills of Langhe, Piedmont’s loveliest sub region. Arrive to your luxurious hotel set atop a vine covered hill, settle in and relax. The evening is yours to dine at the estates superb restaurant. This morning you will have a later start giving you time to go for a walk in the vineyards, have a late breakfast, hit the spa, or sleep in. In the late morning your driver will meet you and you will travel through unspoiled wine country with undulating hills of vines, to the historic Cordero di Montezemolo estate in La Morra. This lovely wine estate provides a great private tour and you will see their scenic vineyards and ancient Cedar of Lebanon before sitting down to a private and special wine tasting of their flagship wines like their juicy Dolcetto d’Alba, fragrant Langhe Arneis and elegant “Gorette” Barolo DOCG. Continue on to the pretty little wine hamlet of La Morra. You have a stellar lunch at Bovio with a stunning view of the vineyard covered valley. Sit back and relax, enjoying the Dolce Vita. Lunch today will not be rushed or hurried, it will be elegant and charming with many wine pairings. After lunch, we suggest a stroll through the village to pop into some of the little shops, take photos, and digest your lunch. On the way back to your wine spa hotel this afternoon you will stop into Pollenzo where the mythical “Wine bank” and the Slow Food University of Gastronomic Science are located. You will tour the immense wine cellar and have a glass of wine. Then the rest of the late afternoon and evening is yours at leisure in your luxurious wine resort. This morning you will enjoy a scenic drive (especially if in October or November when the vineyards are spectacular!) down to Rodello, one of a cluster of wine hamlets famous for its Dolcetto. Arrive at a small family run gem like Mossio, making award winning dolcettos in a converted 17th century monk’s cellars. Valerio Mossio is very personable, and passionate about his wine and this region. You will trek through the manicured vineyard before enjoying an informal tasting inside. The romantic castle of Grinzane Cavour is next, just a few minutes drive through unspoiled wine country. This historic castle is extremely important and symbolic in the Langhe. It is where the annual literary awards are held, and also houses the regional wine shop. 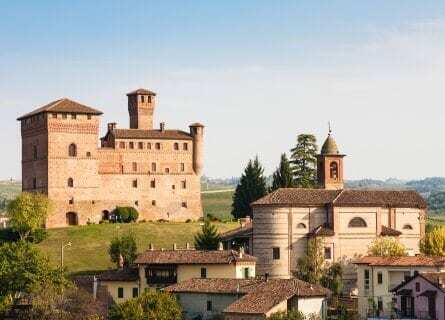 The Grinzane Cavour castle is where countless food and wine events take place such as the annual International Truffle Auction, the meetings for the Italian Cheese Tasters association as well as the order of the Knights of the truffle and wines of Alba. The castle itself is a small museum, which you can visit, interesting for the wine relics like ancient presses, antique cooperage equipment and historic Barolo wine bottles. Enjoy free time here to explore the castle, grounds and wine shop on your own. And finally, lunch will follow at one of Piedmont’s most famous eateries- Piazza Duomo in the famous truffle town of Alba. This is a major highlight and you will delight at the chef’s tasting menu paired with fine wines, benissimo! After lunch, you can spend some free time in Alba before returning to your hotel. On your way back to the hotel this evening, stop into the pretty village of Dogliani for a visit to boutique producer Poderi Einaudi. The wine estate dates to the 1600’s and has been in the family since the late 19th century. Einaudi have been cultivating Dolcetto here since 1904 and their Dolcetto di Dogliani is adored by the wine press. They also make a range of Barolos and Barberas. You will have a private tour and tasting of a few wines such as Barolo Cannubi, Dolcetto di Dogliani I Filari, and the Dogliani “Vigna Tecc”. The evening is yours to relax at your hotel. Today you have a FABULOUS day in store- a VIP full morning and lunch experience with our favorite winemaker in the entire Piedmont- Luca Roagna. You will visit his cellar in Barbaresco, in the same hamlet as Angelo Gaja, and you will spend the morning in the vineyards, the cellar and the family house. Indulge in a superb wine tasting of the best Barolos and Barbarescos the Roagna estate makes before sitting down to lunch with the winemaker himself. The cuisine will be mamma’s cucina- satisfying and rich dishes paired perfectly with sultry red wines. This is always a favorite and a highlight of your tour. This afternoon you will change gear and head into the city, to Turin. Turin is the handsome cultural capital of Piedmont. Elegant archways, stately avenues and grand palaces all characterize Turin. 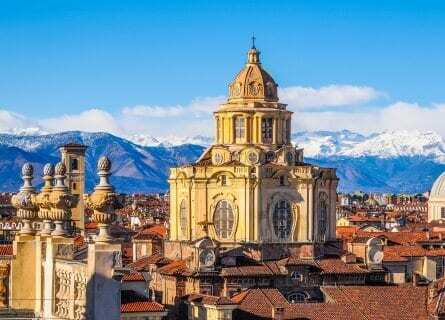 While the city is surrounded by much industry (Piedmont is one of the wealthiest regions in Italy due to its industry), Turin center is a historic gem. Check into your hotel and freshen up and in the late afternoon your own private guide will meet you in the lobby to take you on an insider’s walking tour of the city. You will learn all about the Savoys (Turin was capital of the House of Savoy from 1574), the history of Vermouth and Turin’s many chocolate corners. During the tour you will visit the Via Lagrange with its many gourmet shops and stop for a chocolate and heavenly Bicerin coffee at one of Turin’s historic cafes. The evening is free tonight with our suggestions on restaurants and nightlife. This morning your guide will meet you in the lobby and take you on a fantastic walking tour of the city’s most fascinating sights including the Egyptian museum and Palazzo Reale. Begin with a visit to the historic Egyptian museum, with its collection rivaling the British Museum and Cairo Museum of Archeology. Carry on to the lavish 17th century Royal Palace. This opulent palazzo has dozens of rooms you can visit with period furniture, tapestries and paintings and a royal garden whose landscaper André le Nôtre, also contributed to the Versailles gardens. And after a morning of culture, not to mention walking, you will be famished! Lunch today will be ultra traditional and include famous local dishes like Bagna Cauda and risotto with Bra cheese, paired with Piedmont wines naturally! The afternoon is yours to get in some shopping or more sightseeing. You can check out the cinema museum, the outdoor markets, and the classy shops on Via Roma. Upon arrival to Italy you receive our welcome pack which contains many recommendations on sightseeing, dining during your free evenings, and you can certainly use that as a reference today, Enjoy Torino! But the real treat today is lunch, at the remarkable Combal Zero. Located inside the 13th century Castello di Rivoli (with its modern art collection), Combal Zero is a restaurant you will remember. Chef Davide Scabin is the Ferran Adrià of Italy with outrageous dishes like cyber eggs, liquid pizza and virtual oysters. This is a real gastronomic experience! Lunch will be Scabin’s creative tasting menu paired with specially selected small cult producers from Piedmont, and you can relax and admire the views of the lush valley. After lunch, you will head into Milan for your last evening. We highly suggest a visit to see the Duomo and the Galleria Vittorio Emanuele arcade. Tonight you will sleep in ultra luxury at Milan’s Four Seasons, simply the best! Transfer to Milan airport to catch your outbound flight. And this concludes your magnificent wine tour of the Piedmont. You will leave Italy with some gorgeous photos, some gourmet goodies and unforgettable memories of the truly special people you have met in Italian wine country. Arrivederci! The harmony and balance running through the landscapes and flavours of this ancient land make for an experience of immense charm and prestige while enjoying some of the very best Italian gastronomy. Italy is the land of truffles and great wines, notably Barolo, the wine of kings, the king of wines. 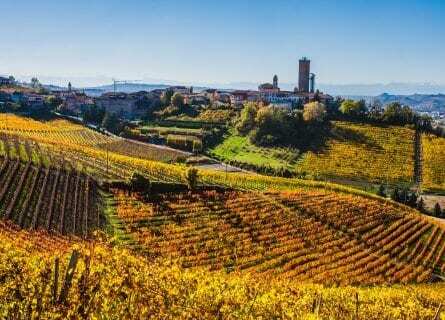 Langhe is a magical place, sprinkled with cities of art and country villages, splendid castles, undulating hills and old roadhouse inns in verdant surroundings. Arrive at Milan/Turin airport. Meet with the tour leader and enjoy a private transfer to Langhe Hills. Welcome aperitivo and check-in at your chosen accommodation with dinner in a charming restaurant. After breakfast, meet with the tour leader and transfer to the Barolo wine area, birthplace of the “king of wines and wine of kings”. There is a private visit with an expert guide to a renowned Barolo cellar to discover the fascinating world of Barolo wine production. We take a wine tasting among the barrels followed by lunch made with local products. After lunch we take a panoramic tour of the Barolo wine area. In the afternoon, we transfer to Grinzane Cavour and our guided visit to the impressive medieval castle, one of the icons of Langhe Hills. Here the exclusive “World Alba White Truffle Charity Auction” takes place every year in November. The castle is also the location of the region’s most important winery, “Enoteca Regionale Piemontese Cavour”. Savour your aperitvo while enjoying the breathtaking view of the castle before dinner in the Michelin-starred restaurant set inside the medieval building. Back to the hotel for your overnight stay. After breakfast, meet with the tour leader and head out for a fantastic cooking experience in a prestigious castle: you will personally execute every phase of a menu preparation picking up some of the secrets of local traditional recipes. After the cooking class, enjoy your lunch. In the afternoon, we visit the Wine Bank, an institution created by Slow Food movement in order to preserve the historic memory of the Italian wine. This will be the location for a sensorial game: the participants will be divided into four teams and asked to guess what type of wine they’re tasting using their five senses. We then enjoy a special sunset hot air balloon flight to discover the gentle hills from another point of view. A final toast will end this unique experience before transferring for dinner in a prestigious historical palace. After breakfast, meet with the tour leader and depart for Turin and a guided visit to Venaria Reale, the magnificent Savoy residence that comprises 80,000 square metres of floor surface in the royal palace, 50 hectares of gardens (adjacent to the 17th-century village of Venaria) and 3,000 fenced hectares of La Mandria Regional Park. This is a natural and architectural masterpiece, UNESCO World Heritage since 1997 and recently involved in the EU’s largest cultural restoration project. 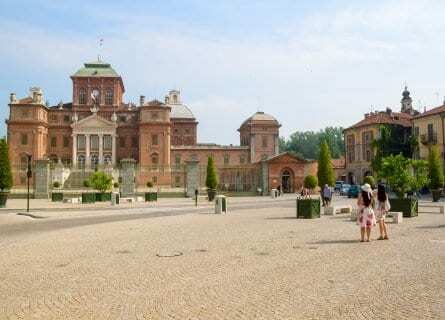 The monumental palace or Reggia boasts some of the finest examples of Baroque, while the gardens bring together an ancient and modern charm, with an extraordinary balance between the archeological remains and the contemporary artworks. We then transfer to the city centre for lunch in a characteristic restaurant. In the afternoon, take an enthusiastic tour through Turin driving Fiat 500's, the symbol of the city, with pit stops in surprising places such as the Medieval Village and Lingotto district. Back to the hotel to relax before dinner in a charming restaurant. After breakfast, meet with the tour leader and depart for an exciting truffle hunting excursion looking for the prestigious Alba White Truffle (Tuber Magnatum Pico) with a truffle-hunter and his trained dog. This is a most exciting experience for truffle enthusiasts. The hunter and dog will lead the group into the woods to seek out the precious underground tuber, guided only by the dog’s sense of smell and the intuition resulting from years of experience. Before the hunt, we hear from an expert, who will provide all the information essential to understand how, where and why truffles grow. Lunch is on a characteristic and charming farm with truffle tasting. This afternoon there is time for some luxury relaxation with entrance to an exclusive spa and wellness centre for a professional massage session. Tonight we enjoy a special dinner in the magic atmosphere of an historical building in a panoramic position. 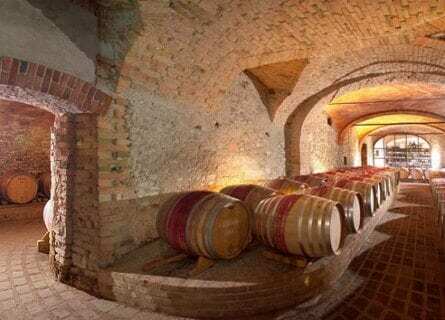 After breakfast, meet with the tour leader and transfer to Dogliani for the Dolcetto Dogliani DOCG wine seminar in a well-known historical cellar. Lunch will be in a charming restaurant and then t's back to the hotel and time to relax. Later in the afternoon transfer to Alba and meet with an expert personal food shopper to be guided in the best shopping of local products and truffles (in season). There is free time to take a walk in the city centre among elegant boutiques and historical buildings. Dinner tonight is in 3 Michelin star restaurant in Cathedral Square. After breakfast, meet with the tour leader and transfer to the Alta Langa area, with its wild landscape dotted by woods and fields. We visit a traditional dairy to discover all the steps of the cheese making process. There is then a tasting lunch with local products and cheeses. We then transfer to Canelli, for a guided visit to the oldest Italian wine cellar producing “metodo classico” sparkling wine and its huge underground cellars, the so called “Underground Cathedrals”, and a designated UNESCO World Heritage Site. We enjoy a tasting of the greatest Italian Spumante wines. We then transfer to Rivoli for dinner in the original Combal Zero restaurant, one of the World’s 50 Best Restaurants, where the chef and owner Davide Scabin astonishes his guests with his hyper-creative, conceptual tasting menu. After breakfast, meet with the tour leader and transfer to Milan city centre and your meeting with a personal shopper and fashion counsellor, to enjoy a unique experience in Italy’s Fashion Capital. Aperitivo and lunch in a charming restaurant. Then take a stroll in the graceful city of Cherasco and savour a tasting of the traditional pralines “Baci” (“kisses”) with chocolate and hazelnuts from Piedmont in an historical pastry shop. Dinner is in a characteristic osteria to taste a typical product of this town: snails. After breakfast, meet with the tour leader and transfer to Gavi wine area, in southeast Piedmont, to discover this great wine region. There is a visit to an historical wine cellar with tasting before lunch and an afternoon at leisure. Tonight we say farewell at a gala dinner in a lovely restaurant. After breakfast, check-out, meet with the tour leader and depart to Milan/Turin airport for your journey home.